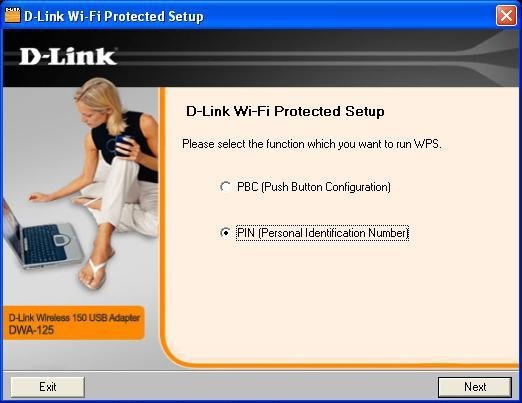 The D-Link DWA-125 uses the Wireless Connection Manager as the management software. The manager provides the user an easy interface to change any settings related to the wireless adapter. Clicking on the Wireless Connection Manager icon on the desktop will start the Configuration. The Wireless Networks (Site Survey) page will display all wireless networks that are available in your area. 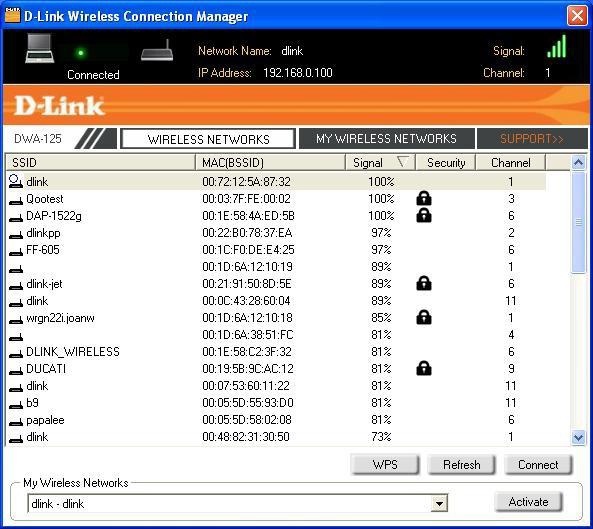 To connect to a network, simply highlight the wireless network (SSID) and click Connect. Wi-Fi Protected Setup (WPS) System is designed for easy setup of security-enabled Wi-Fi networks. It is recommended to have the access point or wireless router nearby during setup. “Push Button Configuration” (PBC) is a virtual button in the utility that connects you to other WPS-enabled devices. A connection can be established by clicking on the virtual button, then pushing the physical button on the access point or wireless router within 120 seconds. “Personal Identification Number” (PIN) is a unique number generated randomly by the wireless adapter’s utility. Entering this number in the utility of the WPS-enabled wireless router or access point connects you with the intended wireless network. Refer to the next page for more information. 1. To connect to your network, press the WPS button on the adapter and hold for two seconds until the wizard screen appears. 2. Press the WPS button located on your access point or router to continue. This screen will appear once you have successfully established connection with your network. If you want to connect using the PBC method. Touse the PIN method, select PIN (Personal Identification Number) and click Next. Make sure your access point or wireless router is close by. Write down the number on the screen. Enter this number in your access point or wireless router. Please refer to the manufacture’s manual for instructions. Once you click Next, you will have 2 minutes to enter this number in your access point or wireless router. The adapter will try to establish connectivity to your access point or wireless router. When this screen appears, you have successfully established connectivity. Click Finish to complete your setup.